Even if this café is not specifically a “baby-friendly” place, it pleased us particularly by its tranquillity and its location…a pretty good address for a break while walking between la Concorde and les Champs-Elysées. Petit Palais is the Art Museum of city of Paris. 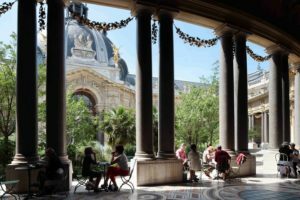 In a superb building, it hosts collections from Antiquity till begining of 20th century…and as (almost) all museums managed by the City of Paris, its entrance to permanent collections is free (entrance fees for temporary exhibitions and workshops). Located in the heart of the building, the café Le Jardin du Petit Palais offers a large room soberly decorated. Its menu shows drinks, light meals and snacks all day long. And, depending on the weather, you’ll be able to enjoy a table in the garden. The café does not have high chairs (but there is room enough to install the stroller next to you). No baby changing facilities neither in the museum (only a “large table” with no changing mat in the Ladies restroom on floor 0…).